In the future, everything will be faster, more efficient, and more intelligent – even when it comes to delivering that pair of cat socks you ordered off the Internet. 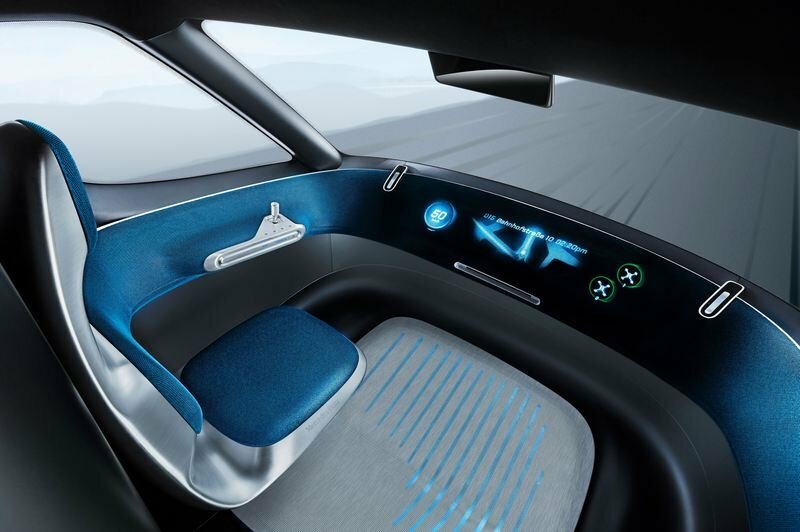 Mercedes just announced something called adVANce, a “future initiative” looking to invest 500 million euros over the next five years in the realms of “digitalization, automation and robotics.” Where’s all that tech going? Why, to vans, obviously. You see, Mercedes is imagining new ways of bringing the goods transportation industry into the 21st century, and the amorphous four-wheeled contraption you see here is the automaker’s first step in that direction. It’s hugely automated, all-electric, and there’s a squadron of drones parked on the roof. Sounds like sci-fi, but something like this concept might be closer than you think. Mercedes says it’s already got 200 employees hammering away on ideas similar to the Vision Van, with folks stationed in Berlin, Stuttgart, and (of course) Silicon Valley. The automaker is also working with tech startups to infuse the timeworn parcel delivery model with fresh ideas and new perspectives. 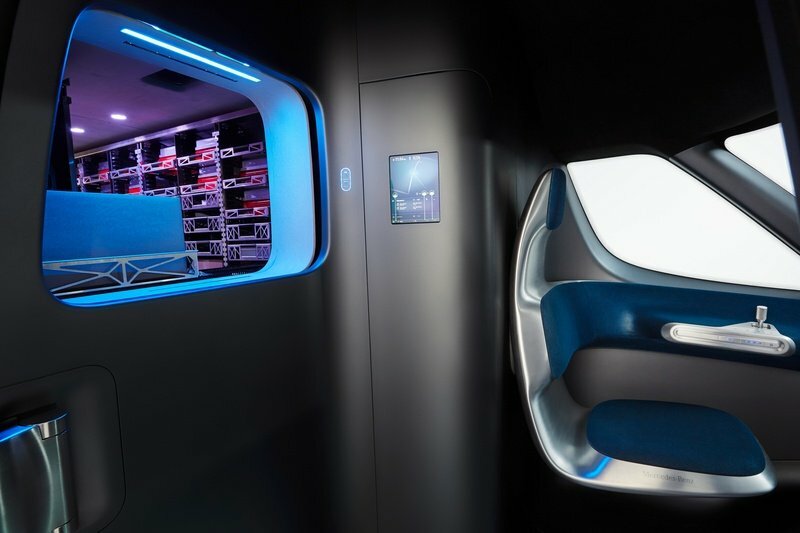 So what are some of the cool ideas we can expect to see in the near future of delivery? Read on to find out. 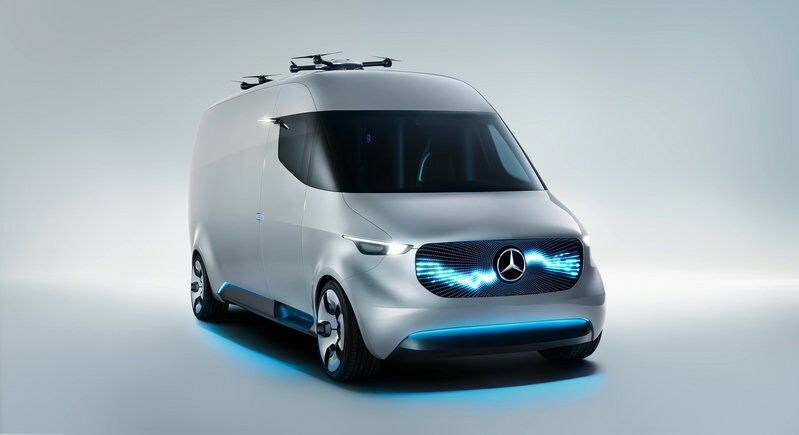 Continue reading to learn more about the Mercedes Vision Van. But there’s more to it than the rise of new business models. There’s also the growing pressures of urbanization – Mercedes says two-thirds of the world’s population will be living in cities by 2030. With the growth of cities comes higher demand for same-day and hourly delivery, like those associated with online food services. There’s also the growth of e-commerce, plus the interconnectedness of the Internet of Things. New ownership models are also appearing, with transportation now incorporating novel ideas with regards to renting, leasing, and sharing. 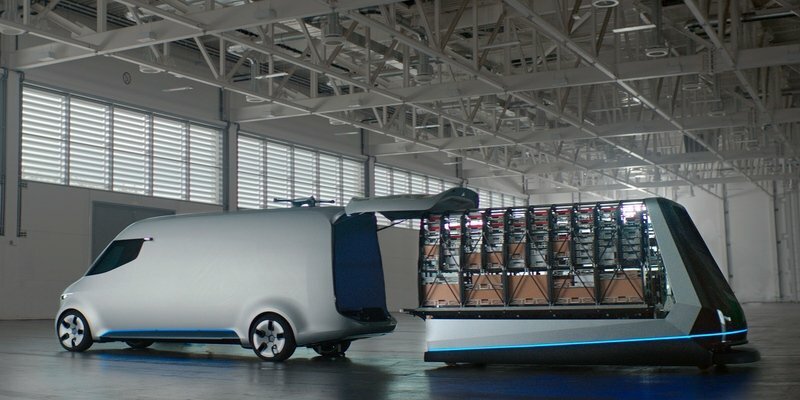 Mercedes says it wants a slice of the action, and to that end, plans on turning the van into an “intelligent, interconnected data center on wheels” by combining automation, robotics and mobility services into one cohesive package capable of serving any vehicle-related business. 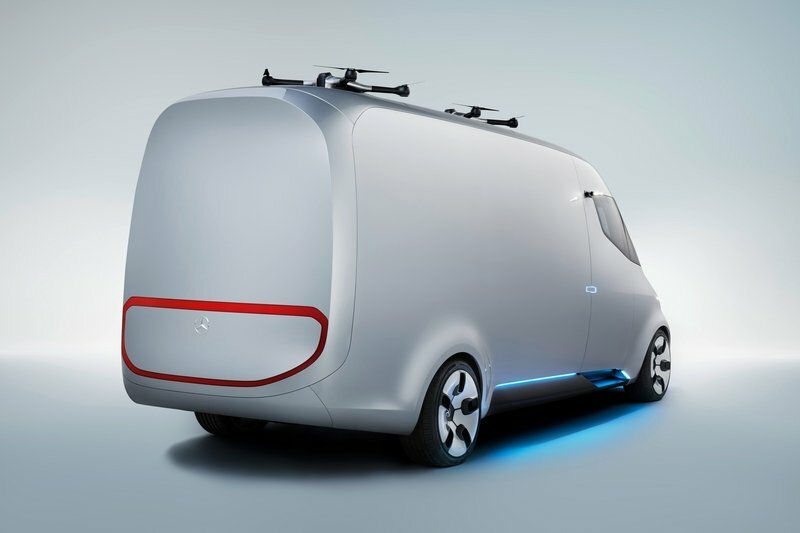 Unsurprisingly, Mercedes wants the Vision Van to be eco-friendly. 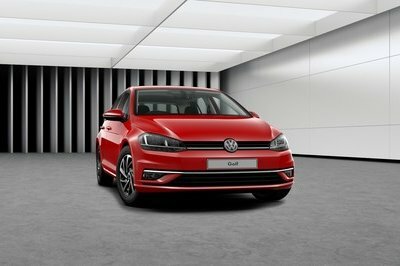 As such, it comes with an all-electric drivetrain, which offers other benefits beyond a reduction in local emissions (check out the Drivetrain section for more). The Van also uses onboard systems to collect data on things like the delivery route and real-time location finding, all of which can be managed from a central hub and changed at the last minute if needed. Another interesting feature is automatic service and upkeep, with the Van autonomously sorting mechanical issues by ordering replacement parts or whatever else is needed to keep things running smoothly. Speaking of autonomous – handing the robots the keys can have huge benefits in the world of four-wheeled deliveries. Here’s how it works. At the distribution center, the various parcels slated for delivery are automatically scanned prior to loading, with info on the delivery address informing the automated load process for maximum efficiency. After being scanned, the parcels are sorted into large, carbon fiber racks made specifically for whatever van they are destined for. The autonomous loader then slides the fully loaded racks into the back of the van, all in a “one-shot” process that takes roughly 5 minutes to complete. With everything already sorted and ready to go, the delivery process is streamlined considerably. Mercedes says “deliverers need to rearrange their packages (on average around 180 per load) ten times while making deliveries within a residential area and schedule approximately three to four minutes per stop,” all of which is avoided in the proposed system. Here’s where things start to get pretty wild. You may have noticed a few drones mounted to the roof of the Vision Van. These quad-copters come from Matternet, a company based out of Menlo Park, California, that develops autonomous drone logistics systems. The drones you see pictured here are Matternet’s M2 model, which offers “automatic payload and battery exchange, intelligent routing and monitoring, precision landing and intuitive command and control,” according to Matternet’s website. The M2 can deliver a payload up to 2 kg (4.4 pounds) at a distance of over 20 km (12 miles) on a single battery charge. The four rotors measure 21.5 inches in diameter. Basically, once the driver has stopped to deliver a parcel by hand, the drones buzz off with smaller packages. After dropping the parcel autonomously at the recipient’s personal delivery station, the drone returns to dock with the van’s roof-mounted landing pad. So what is it about the actual van that makes this thing special? Let’s start with the way it looks. My first impression of the Vision Van was that it looks somewhat similar to the Vision Concept that Merc unveiled last year at the Tokyo Motor Show. It’s got the same long, streamlined, featureless body, with large wheels, glowing LEDs, and zero panel gaps. The only “lines” you’ll find on this thing are in place to identify where the thing actually opens, either for the driver, or the cargo. It looks somewhat similar to the Vision Concept that Merc unveiled last year at the Tokyo Motor Show. This ultra-smooth approach highlights the presence of an LED matrix installed in the nose. This grid is composed of roughly a million individual LEDs, which can be used to communicate with folks in the surrounding environment. For example, the matrix can be used to notify bystanders of a drone coming in for a landing, or simply as advertisement for the company that owns the vehicle. 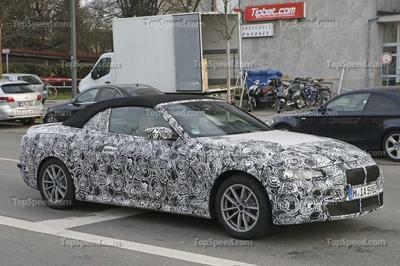 In back is a large, circular ring that takes on the role of taillight. Unlike the passenger-oriented Autonomous Vision presented last year in Japan, I feel like the future aesthetic that Mercedes is going for here actually kinda works on something like a van. These workhorses are supposed to be all about form following function, whereas personal transportation should, in my opinion, have an extra individual touch. The Vision Van uses a joystick for control, replacing the traditional steering wheel and pedals and offering greater space for the driver to move around. The driver is positioned on the left-hand side, with a single seat for when the vehicle is in motion. Surrounding the driver is a broad dashboard that wraps across the full width of the cabin, displaying pertinent information through high-tech digital displays. 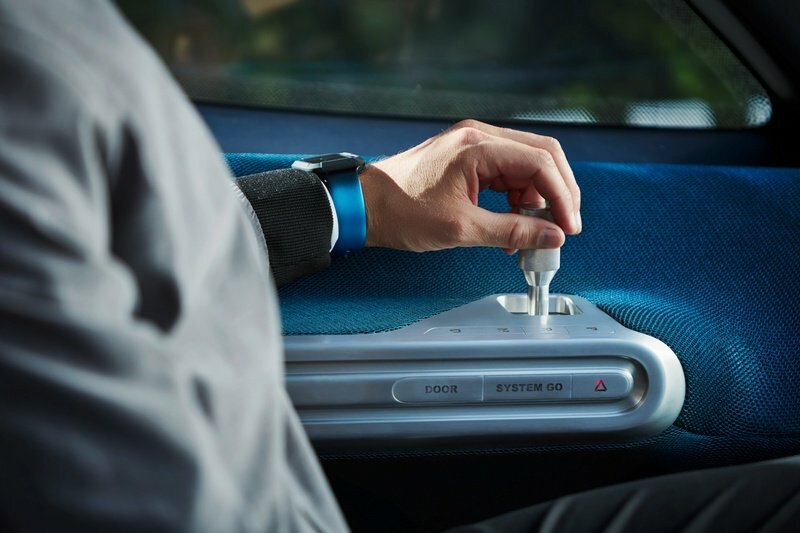 Interestingly, the Vision Van uses a joystick for control, replacing the traditional steering wheel and pedals and offering greater space for the driver to move around. 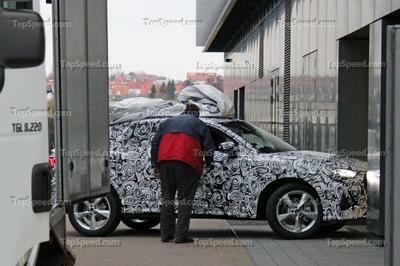 Behind the driver is a small window through which larger parcels are accessed. The parcel is automatically dispensed thanks to an autonomous sorting system built into the carbon fiber loading rack, making it much easier to get the right package quickly. Next to the parcel window is an information panel that displays all required shipping information (“Leave it under the mat!”). The driver exits on the right-hand side by way of a single automatic door. On the floor are more LEDs, which light in certain colors to warn the driver of the presence of pedestrians or cyclists. Making this thing go is an all-electric powertrain. Under the floor is a series of battery packs, which are modular and optimized to fit each given application (factors like the vehicle weight and required delivery range are two factors to consider here). The electric drive unit produces 75 kW (roughly 100 horsepower) and 270 Nm of torque (roughly 200 pound-feet). All that juice is routed to the rear axle for motivation. Range per charge varies between 80 km (roughly 50 miles) and 270 km (roughly 168 miles). 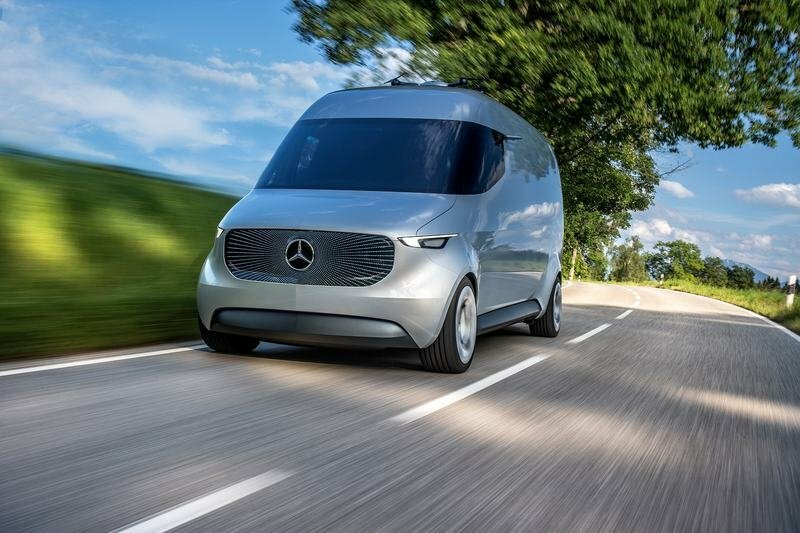 Not only does all-electric power equate to lower local emissions, it’s also silent, which allows the Mercedes Vision Van to deliver goods late at night when there might be restrictions on traffic. Beyond the joystick control and weird styling for the exterior and interior, the Mercedes Vision Van isn’t really that outrageous, if you think about it. All-electric power seems to be the direction most makes are headed – hell, Tesla is even talking about making a battery-powered semi truck. Throw in the added benefits of autonomous loading and parcel sorting, and this thing looks like it’s making the right moves. “But what about the drones?” you might ask. I’m getting to that. This isn’t the first time we’ve seen the inclusion of an unmanned aerial vehicle with a car. Previous examples include Rinspeed Etos Concept from 2015, as well as the Renault Kwid concept from 2014. Rinspeed used the drone to do stuff like pick up flowers for a significant other, while Renault used the drone to scout out traffic jams. Okay, so it’s just a future study. But the fact Mercedes is planning on pouring a half billion euros into ideas like this tells me its more than just a PR grab. This very well could be the way forward for the transportation of goods – at least partially. After all, if it helps a business run smoothly, that’s all the motivation needed to make it a reality. 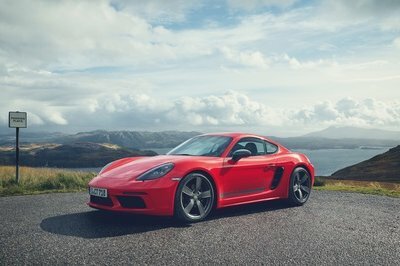 Take away the concept gloss, and this thing has a few very interesting ideas. What do you think? Let us know in the comments. Today the globally successful van manufacturer Mercedes-Benz Vans has unveiled its strategic future initiative adVANce for the transport industry. This sees the division systematically taking up its customers’ changing requirements. The transformation of the industry is the result of various economic and social trends, among them urbanisation, the growth in e-commerce, the intelligent networking of a wide range of technologies in the Internet of Things (IoT), and the proliferation of platform-based business models. "In the first six months of this year, we brought in the best results yet for Mercedes-Benz Vans. This provides us with an excellent foundation to position our vans division systematically for the future", said Volker Mornhinweg, Head of Mercedes-Benz Vans, at today’s Van Innovation Campus in Stuttgart. "To live up to the dramatic changes in our sector, we adapt our ’Mercedes-Benz Vans goes global’ strategy and expand it beyond the product and untapped international markets. We are focusing our attention beyond the vehicle on the entire value chain and business environment of our customers. We provide transport solutions for the digital age and evolve the van into an intelligent, interconnected data centre on wheels. In order to do this, we are investing around half a billion euros over the next five years, and we created a separate organisational unit. So far, this approach is unique within the van sector." With the adVANce initiative, Mercedes-Benz Vans is systematically adapting to new, rapidly changing customer requirements. Examples include the burgeoning business in food and everyday necessities ordered online. Here, demand for same-day delivery or delivery within an hour is increasing rapidly. At the same time, more and more people are living in cities – by 2030 urban areas will be home to more than two thirds of the world’s population. It is clear that the rising transportation requirements will need to be met even faster and more efficiently in future and, above all, in an environmentally friendly way. Mercedes-Benz Vans is presenting a fascinating, integrated solution for new customer requirements with the "Vision Van" van study, which was presented today and evolved as part of the adVANce initiative. This all-electric vehicle combines various innovative solutions for last-mile delivery in urban and suburban environments. It is the first van worldwide to fully digitally connect all people and processes involved, from the distribution centre to the consignee. 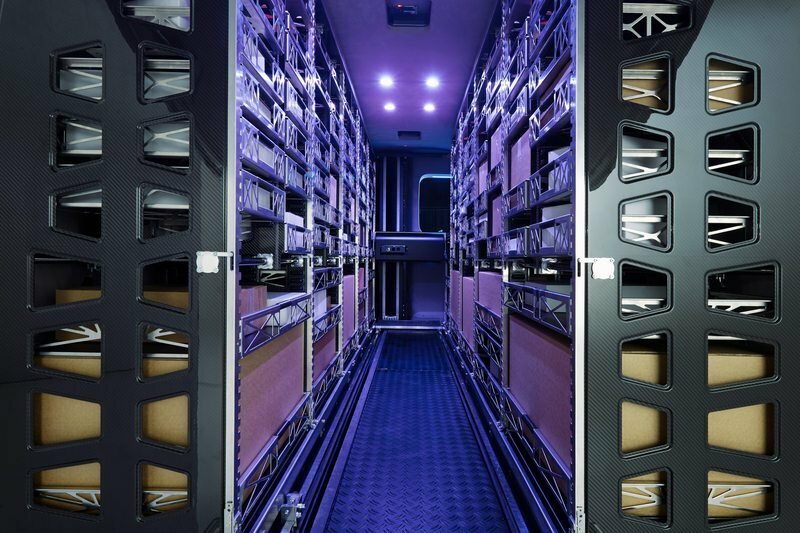 Furthermore, it is the first van ever to feature a fully automated cargo space and integrated delivery drones. 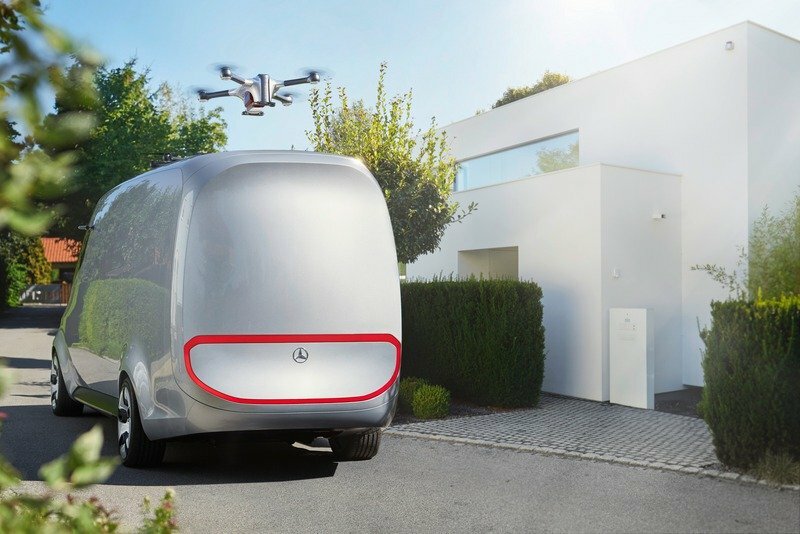 For example, if a parcel service provider stops his vehicle in a residential area, it will be possible to deliver multiple packages to nearby consignees autonomously by air – even if they are not at home – in addition to manual delivery. This makes the deliverer’s job easier, reduces the delivery time and offers end customers new opportunities such as same-day delivery at an agreed time. 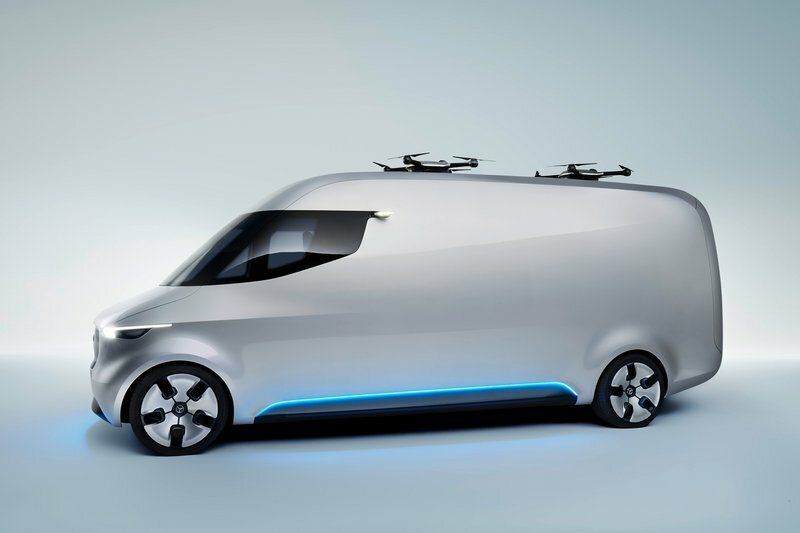 Mercedes-Benz Vans envisages deployment of the Vision Van boosting efficiency by up to 50 percent on the last mile. The vehicle is equipped with a 75 kW electric drive and – depending on the intended application – has a range of 80 km to approximately 270 km. With the Vision Van, deliveries are emission-free. 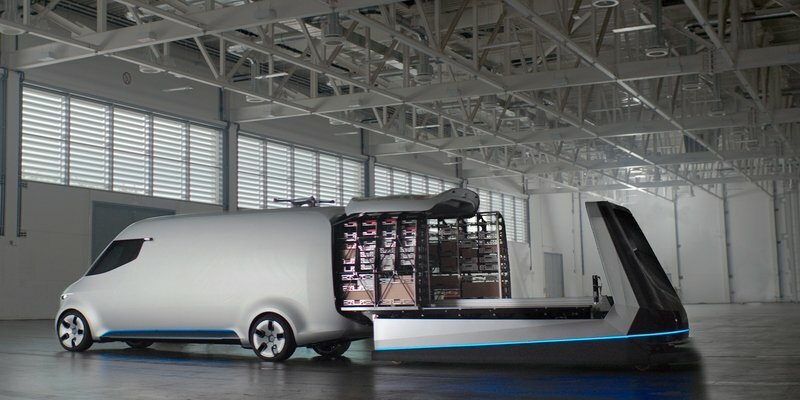 "With the Vision Van from Mercedes-Benz Vans we provide an idea of future generations of vans: the intelligent automation technology connects the entire process, from loading and transportation by road through to delivery to the consignee. This makes it easier for the deliverer to do business and rapidly reduces the delivery time for end customers", adds Volker Mornhinweg. "Equipped with an electric drive system, the Vision Van not only operates locally emission-free, it also moves almost silently. This means that it can be operated in cities even during times when there are traffic restrictions or for late-night deliveries in residential areas. This gives our customers the possibility of offering new services to their customers." In the first half of 2016, Mercedes-Benz Vans achieved the best figures in its history. Unit sales increased by 21 percent to approximately 176 200 vehicles (prior-year: approximately 145 400 units). The entire product portfolio contributed to this increase in unit sales. Revenue was up 19 percent to 6256 million euros, another best-ever level (prior-year: 5244 million euros). EBIT and return on sales climbed by 56 percent and 30 percent to 702 million euros and 11.2 percent reaching a new record level (prior-year: 449 million euros and 8.6 percent). Mercedes-Benz Vans anticipates further significant growth in unit sales for the 2016 financial year as a whole. The business division is also expecting a significantly higher EBIT from ongoing business in 2016 compared to 2015 as well as a significantly higher return on sales.